Tired of opening your wine bottle and seeing cork remnants in your glass? Get the Sharper Image Tabletop Corkscrew Wine Bottle Opener Stand and quickly remove any natural or synthetic cork from your favorite wines! Add a little pizzazz to your next house party or gathering with this innovative height adjustable wine bottle opener! An ergonomic handheld lever, foil cutter, and suction base gives users the chance to pop open any wine bottle at the wet bar or on the kitchen countertop with a secure grip. It also has a sleek matte black finish accented with brushed silver to give this tabletop corkscrew wine bottle opener a sophisticated style which works with any type of home decor. You can count on the Sharper Image Tabletop Corkscrew Wine Bottle Opener Stand to work every time thanks to its sturdy and durable construction. It's one stylish and functional device perfect for the home or even a gift for someone special! Don't Wait! Unwind With Your Favorite Glass & Click "Add to Cart" NOW! CELEBRATE THE GOOD TIMES with the Sharper Image Tabletop Corkscrew Wine Bottle Opener Stand! This nifty device features an innovative lever structure that allows anyone to pop open their favorite Merlot or Zinfandel without the fuss! SIP WITH EASE: Remove corks quickly thanks to the wine bottle opener's height adjustable design! Slip in your favorite bottle into the opener, use the foil cutter to slice the top portion off, and bring the lever down to yank out the cork with the built-in corkscrew. GET A GRIP: Never worry about your hands cramping thanks to the Tabletop Wine Bottle Opener's ergonomic lever construction! 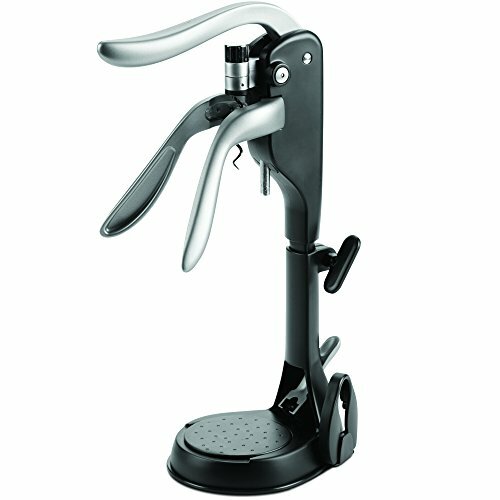 It fits perfectly in the left or right hand while giving users the ability to unfasten any natural or synthetic cork. DURABILITY YOU TRUST: The Sharper Image Tabletop Corkscrew Wine Bottle Opener is built to last multiple uses without budging! Secure it onto any wet bar surface or the kitchen countertop using the suction base and it'll stay in place. SLEEK & POLISHED: A matte black finish plus brushed silver accents give the Tabletop Corkscrew Wine Bottle Opener a sophisticated accent that works with any type of home décor! It's also a wonderful gift for any house party or social gathering.